My dad would have turned 60 this week. He exemplified all the phrases the French use to describe an excellent human being – joie de vivre, je ne sais quoi…OK, I’m out. Je ne parle pas Francais. (Thanks, Google Translate!) But you get what I mean. You really and truly cannot find a soul on God’s green earth that had met my dad and didn’t love him. Well, except for the people he cut off on the road and on the sea – not the world’s greatest driver of cars and certainly not of boats, as you’re about to find out. To honor this occasion, I solicited happy memories and hilarious stories of my father’s many mishaps. I was shooting for 60, but I should have known this request would far surpass my expectations. Below are submissions from family and friends presented in no particular order and with minimal editing, save for some snarky insertions from yours truly. Because most people had several stories to share, I tried to keep these in bite-sized chunks. To me, the most astounding thing is that there were so few repeats of stories, except the broken wine jugs and the fruit flies. You’ll see common themes: lots of vacation follies and a lot of people sensing they were in danger while out on our old boat, the Barrel of Monkeys. Yet, we all kept taking trips and setting sail – not wanting to miss the adventure. I stole the title from AJ’s story, the last of the bunch. I promise it will make sense when you get to Uncle Anthony’s stories. Mark: Mom – We loved Beavis and Butthead growing up but Mom never let us watch it. One night she went to see Rod Stewart and stayed in a hotel. After dropping her off with Aunt Joan Dad returned with candy, ice cream, the Beavis and Butthead video game and every episode Blockbuster had. Net Net again: Mark was driving home from Corrado’s with your mom’s station wagon full of bottles of grape juice to make his wine. He got all the way home and as he turned into the drive he hit a raised manhole and heard a faint glass against glass. He opened the back and two large bottles of grape juice poured into the car and onto the drive. They could never get the smell or fruit flies out of the car! Me: Back in the good old days when I was still an only child, we took a trip to Disney World (Dinsey World in my parlance) which I’m pretty sure my parents used as bribery to get me out of diapers. One day at Magic Kingdom, Dad wanted to ride Space Mountain but must have felt weird about being a grown man alone on a theme park ride because I can’t think of any other reason to guild a child onto an admittedly tame roller coaster. Mom was pregnant and couldn’t ride and was heading to a gift shop somewhere. “You don’t want to be stuck doing boring shopping, do you?” he cajoled me, a very small, very scared child. I relented and we shot through the darkness together – him laughing, me sobbing. Our cousin Carolyn: He always referred to our house as Uncle Jackie’s Adventure Camp and as soon as ya’ll got there that is just what it turned into. I also loved the story he told me about skiing in Tahoe blinded by the snow. I think about him each time I hit the slopes. My parents’ friend Adele: I too remember your dad’s laughter and calling my husband Fluffy when they went for their weekly walks and Steve calling him Marky Mark! He is so missed! My mom’s friend Lori: he was always a kind man with a big heart and had a beautiful smile. More Larry, sharing his thoughts on behalf of the rest of the Rays: We miss Mark’sjet ski rides down the lagoon on Saturday mornings. His ability to balance the surf board while riding his bike. His complaint about the ATM fees at Chuck’s. (editor’s note: I plead the 5th.) His jambalaya feasts. Meghan again: At another James Taylor concert at PNC Bank Arts Center, Big Larry Dawg and Big Marky Dawg were tailgating… enjoying some sub sandwiches and Arbor Mist when a older gent approached them asking if they had any “papers.” To which they replied, sure! We’ve got the Star Ledger here. Our friend Lois: We miss you, Mark, so much. You were always a kind and sincere friend. We miss going out to dinner with you and Lynn, our shared love of food and travel, and our many talks about our families. We also miss your pranks and laughter especially the bathing suit “incident” in St. Martin and our catamaran ride over you while you were scuba diving in Antigua! You were the best! Happy Birthday! My mom’s friend Chitra: He was very a very lucky man to have such a beautiful wife and three wonderful children. Remembering him and thinking of all of you on his 60th! Our Uncle Jack: “So let’s go fishing,” he says. We jump on the boat. He pulls the anchor. Off we go. In the bay he wants to show me how fast his boat is. Takes off at full power into a choppy bay, the anchor breaks loose grazes my skull, actually felt it on my ear, turn the boat around go back to the house so I can change my pants and have a beer. The man was a lot of fun but extremely dangerous. Our friend Tony: A group of us were in Ixtapa, Mexico on vacation and your father and I went out early one morning to check out parasailing. We began negotiating with the guy for a price. He looked at me and said ok for me (I was only about 180 #) but then he looked at your father and said NO to him. He said to Mark, “Too fat”. We laughed our asses off and went to eat breakfast. Our friend Joe: Where to start? Joe again: How about up in Syracuse, when your family was visiting my senior year, and like everybody got tired and called it a night except for him, so we went to Darwin’s and crushed Grateful Deads until your mom called him wondering where the hell he went? Pretty sure I had to walk him back to the Sheraton that night. How about him calming me down and telling me what to say to the judge when I got my first speeding ticket? How about every time I came thru your door, he greeted me with hearty “JOE MOORE!” Which your mom continues to this day. My dad’s best man Hugh: I have many stories but this one always makes me laugh. When we were in Europe, disguised as world travelers, we borrowed a bed sheet from a beautiful $2 a night hotel to use as a beach blanket since we were on our way to Cannes on the French Riviera. Mark was sporting an Afro style head of hair and black converse sneakers and a tie-dyed t shirt . We walked on the beach as though we belonged there put the sheet atop the shale, no sand, and proceeded to act as though we were not in agony. The millionaires did not know what to make of us. Later that day we stopped for a drink and a few people were pointing at us and laughing. I guess they were at the beach earlier. We were doing aSaturday Night Live skit before its time. Our friend Joann: Thank you for asking me to reflect on the wonderful friendship and memories, that we have with your wonderful family. (editor’s note: eh, we’re OK I guess) When I think about Mark so many wonderful things come to mind like his pride and joy of his family, He loved Lynn and Jessica, Mark and Andrew so much it was a pleasure to hear him talk about all of you. We have so many wonderful memories, St. Joseph, Halloween, Dinners, making our tomatoes . One memory that always makes me smile is when we decided to get together with my neighbors Felicia and John and take them out for helping us make the Sauce. I called the restaurant to make the reservation and the owner says “great I maka something special for you when you come.” So we go as we are all getting settled at our table the waitress comes over and presents us with several covered silver plated and says My dad sent these out special just for you Capuzzelle and runs away. Mark opens the cover and there is a Lamb head with its tongue sticking out of the side of its mouth. Lynn and I were ready to run out of the restaurant. Felicia and John , and Lou loved it they were sticking their forks in the head, we sat there drinking the wine and laughing, by the end of the night my cheeks hurt. We all laughed and talked about that night for a very long time. Lots of love to all of you and may the memories of Mark live on forever. Our Uncle Anthony: I’m not much at writing. But I do have stories to tell. I used to laugh so much with him, at him, at me and at us two together. They were like the Master Card moments, priceless to me. Remember one of our trips home from Florida. When he taught he was following AJ into the men’s room at the airport, but instead he went into the ladies room. Never realizing he was in the wrong bathroom. He never even noticed AJ was not there with him. Boy, did I ever love that one. Might be my favorite. More Uncle Anthony: There was our weekend in Newport R.I. With the four of us back in 85 when he took all these pictures of Lynn Joan and myself in front of the mansions and of Jackie Kennedy’s home. But when he went to change the roll of film there was none in the camera. More Uncle Anthony: Ask Little Mark and AJ about our trip to EL Yunque rainforest. Mark just said “Dad, don’t do anything stupid on this trip.” (editor’s note: fat chance) Next thing we know we are going the mountain the wrong way on a one way street then back up on top of a big boulder. Ask your mom when Little Mark was hanging onto the door of the car on Eagle Rock Ave.
Uncle Anthony again: There was the time you were about 3 and your were playing with one of his big kid toys.. And broke it your dad said “She breaks everything of mine.” (editor’s note: JESSICA YOU BREAK EVERYTHING I OWN was a common refrain in my life…stop having such breakable stuff, Dad.) The 4th of July boat ride in the storm. When he blamed Lynn for not packing his underwear on one of our trips. Tried to drown me in Aruba. Our Aunt Joan: Through some comedy of errors, he somehow ended up with a cream-sauce based dish on vacation in the Bahamas at Café Martinique, despite asking for no cream. He threw a hissy fit, threw his napkin down…and ate it anyway. More Aunt Joan: He put the wrong kind of gas in the car on a road trip to Williamsburg VA and almost blew the whole car’s system. Accidentally snorkeling in a hotel’s sewage output in the Bahamas. Mom again: Mark loved to participate in his kids’ events and, as such, he volunteered to coach flag football. At one practice he was talking to his team and he thought it was starting to rain, only to turn around and find one of the kids squirting him with a water bottle. Our cousin Joanie: I don’t have a story… Just an observation. I have always felt Uncle Mark had that extra something. A twinkle in his eye a smile on his face that was always friendly. That chuckle before words were ever spoken. A gentle entertaining soul that made everyone feel as though he was so glad to see you. You couldn’t help but to mirror his enthusiasm for life. I have never really come across another human who made me feel this way .The twinkle, that laughter and that zest for life! Our friend Al: I can probably give 60 things myself (as I am sure everyone else can too). But to stick with one, this might have to be it: Your dad was someone I could talk to about life and lean on when I needed advice. Whether it be at your house or surfing or just talking, he always made me feel better. His best advice, and one that I’ll never forget, was telling me “I wish I had taken more time off before going to law school.” (I’m sure he told me this at least 10 times) Of course I thought he was crazy, because I was struggling hard to get into med school, and he knew that but looking back he was 100% right. He knew that I would be doing that for the rest of my life, and the time I spent not worrying about such things and enjoying life was definitely much more beneficial. Not to mention the amount of time it allowed me to spend with family and friends. I always think of those conversations when I tell people I “took 5 years off or so” and it’s always a good reminder of how great he could always make me feel even when I was down. Me: My 24th birthday was a snowy mess and no one could make it down the shore to celebrate, except for my parents. Katie and Pat, like me, lived in their families shore houses and we had formed a solid off-season crew of people who pretended to be normal adults while mooching as long as possible. All five of us started at the Sawmill’s Holla for a Dolla (dollar Miller Lites, dollar shots, dollar slices – what more can you ask of life?). Katie, Pat and I took a round of whatever the dollar shot of the night was and Dad was genuinely butthurt that we didn’t get him one – he wanted to be in on the fun, even if it tasted like well vodka and came in a plastic portion cup. We moved the party over to Hook’s where Dad and Pat challenged some fellow patrons to beer pong. As the birthday girl, I was invited to take Pat’s spot for a round, despite probably trying to beg off. My beer pong s kills have always been atrocious, which Dad then loudly and roundly mocked to everyone else in the bar, demanding to know what he had spent my college tuition on. It was hilarious. AJ: Thanksgiving 2007. I was a senior in high school and Mom and Dad had taken me to look at colleges in California. We had landed in San Diego, rented a car, and made it as far north as Santa Barbara. Along the way we had hit about six schools, shared a lot of meals (my father talked about the burgers at Hodad’s in Ocean Beach for months following), had a ton of laughs, and shared very close quarters. We were fortunate enough to spend a few days in Los Angeles with my cousin Jason and his wife Anna (pre-Mira, Petey, and Dezy days). Besides eating Thai fried crickets (my Dad’s idea) and a lovely rooftop Thanksgiving dinner with my family, one particular memory has remained with me through the years. On Thanksgiving morning, while everyone else in the house slept, Big Mark and I woke up before sunrise and drove to Manhattan Beach. With borrowed surfboards strapped to the borrowed roof of our borrowed car we pulled up to an empty, beautiful California state beach with the sun rising above the hills at our backs and airplanes from xxxxx airport trailing ahead of us before fading over the horizon. As we slipped into our wetsuits and marched to the water’s edge, I stopped suddenly and stretched my arm across my father’s chest like a mother protecting her child in the passenger seat. 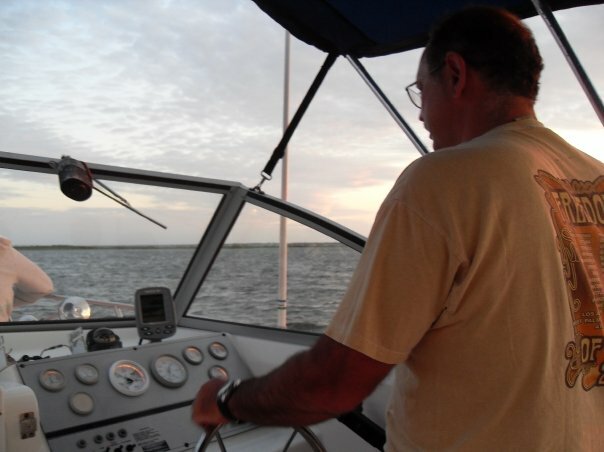 Despite my better judgement, I listened to the one man who would always look out for my best interest and tip toed through the breakwater and across the shallow sand bar. We quickly traded off numerous waves and my mind slowly eased – after all, this man is a well respected attorney, I thought, he must be at least somewhat reputable. About an hour had gone by and that fin was all but gone from my mind. My father had just caught a nice little wave onto the sand bar and had turned to paddle back out to meet me where the waves were breaking. As he pushed off the sand and jumped back onto his surfboard he let out a blood curdling scream, “Ahhhhh,” he yelled, “something bumped me!” I turned around to see the very same dorsal fin from that morning circling a few yards behind him. He reached me out of breath from paddling so hard and the fin slipped beneath the surface. Deciding not to waste any time, we both paddled for the next wave and safely headed to shore. “I told you so!” I nudged him, with sand safely beneath my feet. I’m not going to say that that shark fin was small, but it certainly wasn’t big. We later laughed about the incident as we told people over turkey and stuffing, and every time my father told the story the shark fin got bigger and bigger. That was life with my father: blissful moments with just the right amount of terror. I’m very lucky to have gotten to spend the amount of time I did with such an incredible human. I’m sure that his 60th year on earth would have been just as exhilarating as the rest. Miss you and love you Dad. I laughed and I cried, I wonder how the party would have been. He had a lot of stories to tell how many more memories he would have made. There never was a dull moment when he was around and we miss that liveliness that he pursued! beautiful Jess , a wonderful tribute to a wonderful man, husband, father, and friend, may all the wonderful memories help to ease the pain of our loss Love to all you. Jessica you Dad must be laughing his A– off !!! he sure was one Terrific Guy ! JESS, HE WOULD BE SO PROUD OF ALL OF YOU!! We miss him so much everyday!!!!! Beautiful! He was a great man, father , husband and friend. He was so very proud of his family!